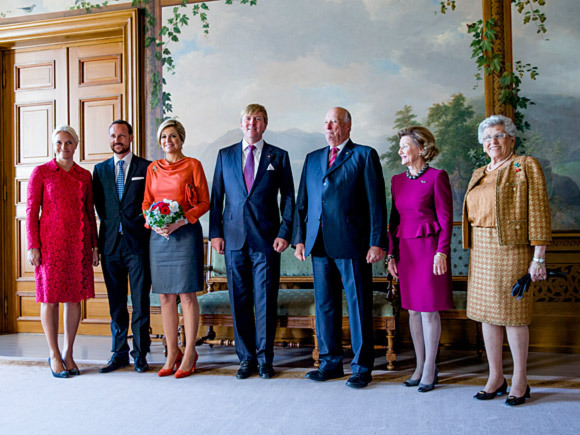 Their Royal Highnesses The Crown Prince and Crown Princess received the Dutch King and Queen at Oslo Airport Gardermoen and accompanied them to the Royal Palace. King Harald and Queen Sonja officially welcomed King Willem-Alexander and Queen Máxima in the courtyard outside the Royal Palace at noon today. 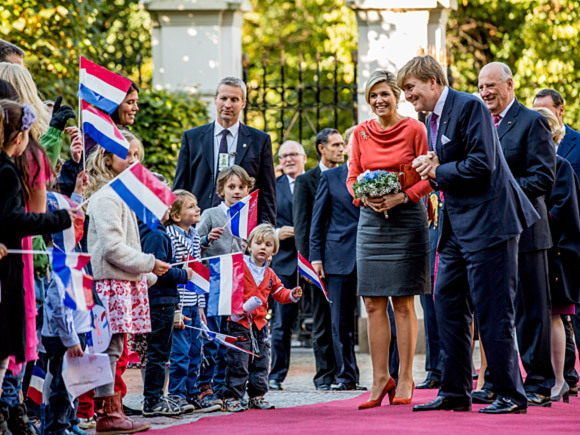 Children from the Dutch school in Oslo also came to greet the Dutch King and Queen carrying flags. Their Majesties and Their Royal Highnesses then entered the Palace where they met Her Highness Princess Astrid, Mrs Ferner, for official photographs in the Bird Room. 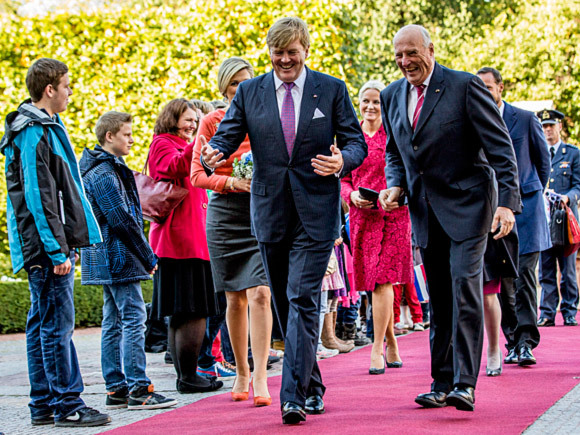 Following the welcome ceremony at the Palace, King Willem-Alexander and Queen Máxima visited the Storting where they met with the President of the Storting, Mr Dag Terje Andersen. 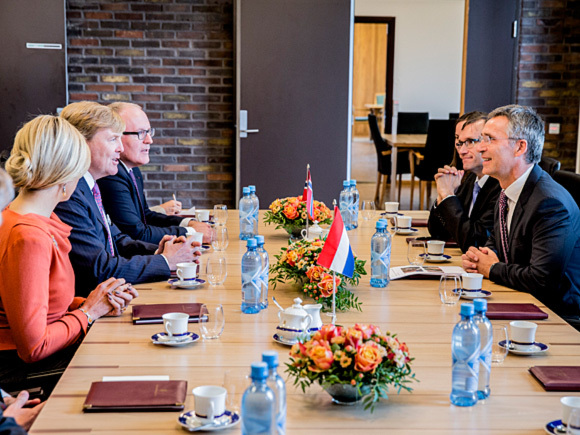 They then visited the Office of the Prime Minister where they met with Prime Minister Jens Stoltenberg. At 2:15 pm King Harald and Queen Sonja hosted an official luncheon in honour of the Dutch King and Queen. Crown Prince Haakon, Crown Princess Mette-Marit and Princess Astrid, Mrs Ferner were also in attendance. His Majesty presented Queen Máxima with the Grand Cross of the Order of St. Olav. King Willem-Alexander received the same honour in 1996. Their Majesties then said their good-byes to King Willem-Alexander and Queen Máxima, who will leave Norway this afternoon. King Willem-Alexander ascended the throne on 30 April of this year, upon the abdication of his mother, Queen Beatrix, who reigned as Queen of the Netherlands for 33 years. The investiture ceremony was held in the Nieuwe Kerk in Amsterdam. Royal guests from around the world – and thousands of Dutch citizens – watched as the new King swore his oath of allegiance and gave his first official speech as the King of the Netherlands.